The SPY Whip MX is the second cheapest motocross goggle produced by SPY and is known as a perfect combination between price and quality. 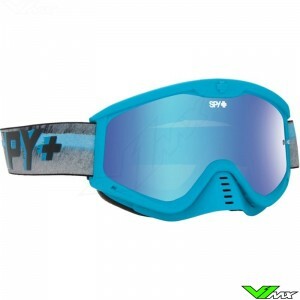 The frame of the SPY Whip MX goggle is made from flexible polyurethane. A triple layer of moister-wicking face foam provides a comfortable and ergonomic fit to the riders face. The Strap of the SPY Whip MX features a ribbed silicone coating that provides excellent grip on the motocross helmet and prevents slipping. The SPY MX Whip motocross goggles have a scratch-resistant and anti-fog lens that also offers 100% UV protection. This SPY goggle is available in many different colours and designs, on top of that also the lenses can be bought in various colors. 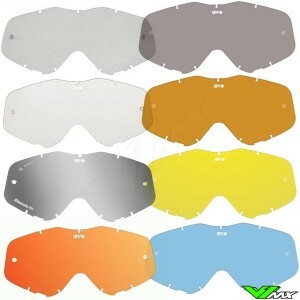 Accessories for this motocross goggle are also available at V1mx. 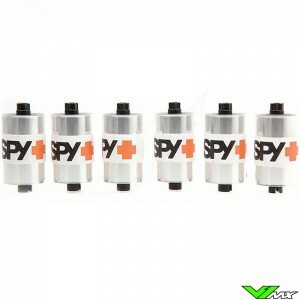 To remove the mud from the SPY Whip MX you can buy a roll-off kit with roll-off rolls or tear-offs. In addition, Individual lenses can be purchased in different colors for optimal contrast and protection with your driving surroundings.